We’ve put together a guide to visiting The Alamo in San Antonio as well as the San Antonio Missions National Historical Park. No visit to San Antonio Texas is complete without visiting The Alamo! We’ll give you a brief history of The Alamo and the Battle of the Alamo so you can better understand and appreciate this popular attraction. Then we’ll tell you everything you need to know in order to visit The Alamo in San Antonio, including how to get here, fees, tips for parking, what to see, and nearby attractions in San Antonio. We also give you an overview of the Spanish colonial missions in Texas and why these were constructed. 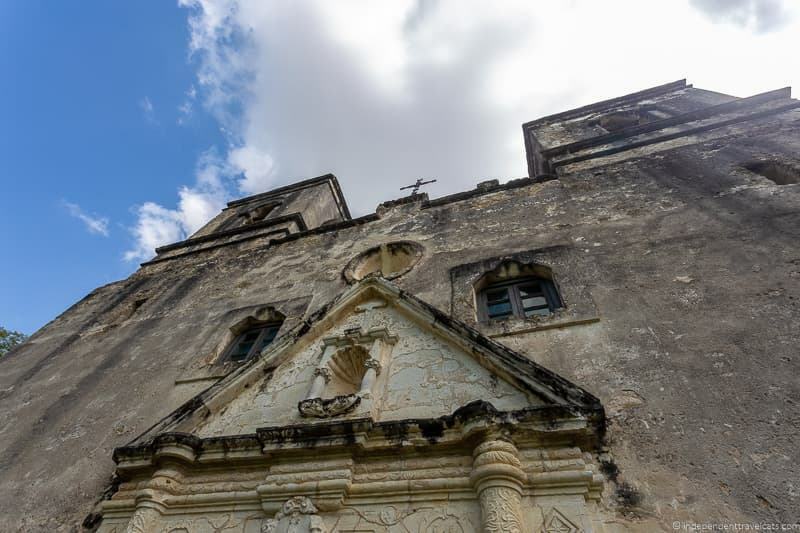 In addition to The Alamo, there are four other Spanish missions that you can visit in San Antonio and these form the San Antonio Missions National Historical Park. We share information on each of these mission and tips on how to visit and plan your time in the park. Why is The Alamo Famous? What is The Alamo Used for Today? Where Can I Learn More about The Alamo? How Can I Help Preserve The Alamo? How to Get to the Alamo? Where to Park for The Alamo? What is the Cost of Visiting The Alamo? Should I get an Audio Guide or do a Guided Tour at The Alamo? What is there to see at The Alamo? Wheelchair Accessibility at the Alamo? Alamo Historical Sites Outside of the Main Visitor Attraction? Where Can I see the Alamo: Price of Freedom IMAX Film? What is the Battle for Texas: The Experience? Other Attractions Near The Alamo? How to get to the Missions in San Antonio? How long is the Trail of the Missions? What is the cost of visiting the Missions? When are the opening hours for the San Antonio Missions National Historical Park? 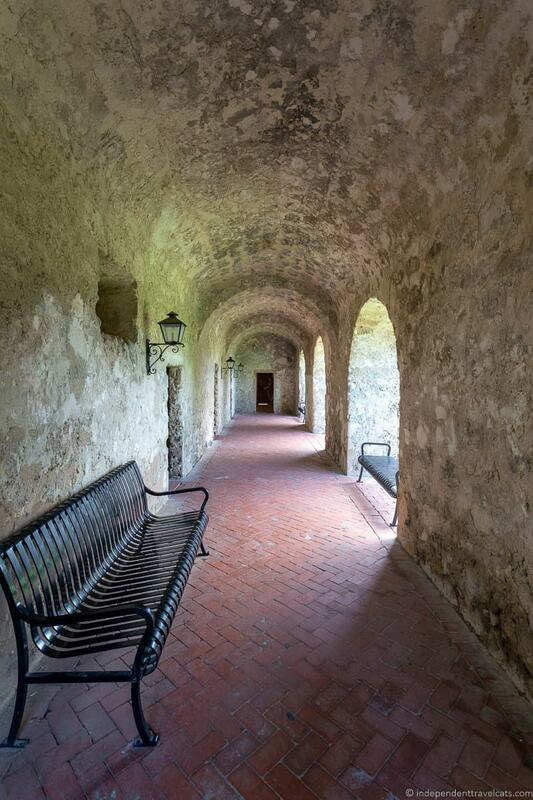 Facilities at the San Antonio Missions National Historical Park? Can I attend Services at the San Antonio Mission Churches? How many missions are part of the San Antonio Missions National Historical Park? Before we delve into all the details of visiting The Alamo, we wanted to first provide a bit of background and history on The Alamo for those who may not be familiar with Texas history. Or for those who perhaps need a refresher! 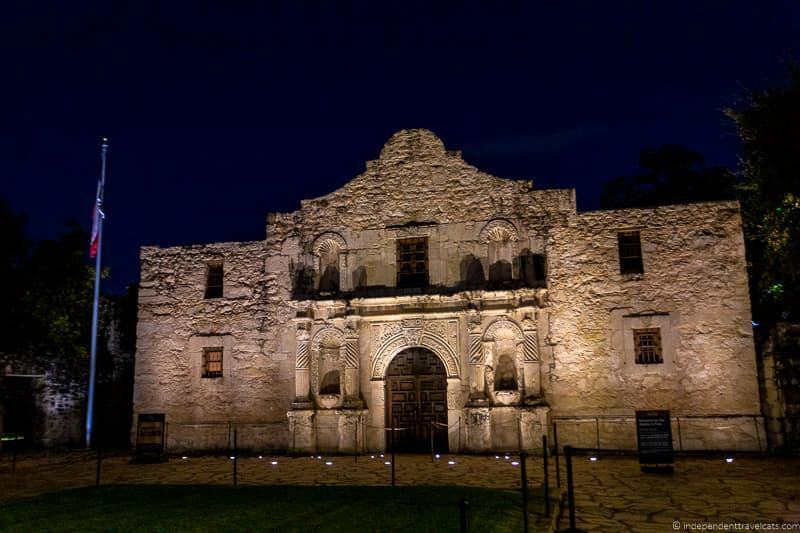 This information should help shed a bit of light on the reasons why so many missions were set up in San Antonio, The Alamo’s role in the Texas Revolution, and why The Alamo is significant today. The Spanish government began setting up missions in the Americas in the 16th century. The primary goal of the missions was to spread the Roman Catholic faith to the native people of the region. Spanish Catholic missionaries included Dominicans, Jesuits, and Franciscans who all came to preach and spread the religion to the area. The missions were also used to teach the local people the Spanish language, customs, and practices, provide basic education, and to encourage the people to acquiesce to Spanish demands. The missionaries also introduced European farming techniques, new machinery, and new crops to the region. The first mission was built in Spanish Texas in 1690. The first of the missions to be built near San Antonio was San Antonio de Valero, now known as the Alamo Mission. The early Spanish mission buildings were built from grass, mud, and wood. Later missions would be constructed from stone. Several missions would be set up in or around San Antonio in the 18th century to evangelize the native people, primarily the Coahuiltecan people. Many of these missionaries were ones that had already been founded in East Texas and were moved to San Antonio as the Spanish felt they could more adequately supply them and defend them from the French there. However, the declining power of Spain in America (and the rise of power by the Republic of Mexico), would lead to a decline in the finances and power of the missionaries in the late 18th and early 19th century. These missionaries were all secularized by 1824. After secularization, many of them were largely abandoned and most fell into disrepair during the 19th century. Thankfully, due to preservation and restoration efforts which started in the late 19th century with the Daughters of the Republic of Texas and which has continued throughout the 20th and 21st centuries, five of the missions around San Antonio have been preserved today. The four missions to the south of the city are now all active Catholic parishes, with churches holding worship services. The exception to this is The Alamo, which has remained as a tourist attraction rather than an active place of worship. In July 2015, both the Alamo Mission and the San Antonio Missions National Historical Park (which encompasses the 4 other missions in San Antonio) were designated a UNESCO World Heritage site. The Alamo has served many purposes over the past three centuries, primarily as a Spanish mission, a military garrison, and a tourist attraction. The San Antonio de Valero mission was the first Spanish mission to be built in the present-day San Antonio area. It was established in May 1, 1718 by Father Antonio de Olivaras. Its original name was a combination of the missions founder’s patron saint’s name (San Antonio de Padua) and that of the then viceroy of New Spain (Marquess de Valero). 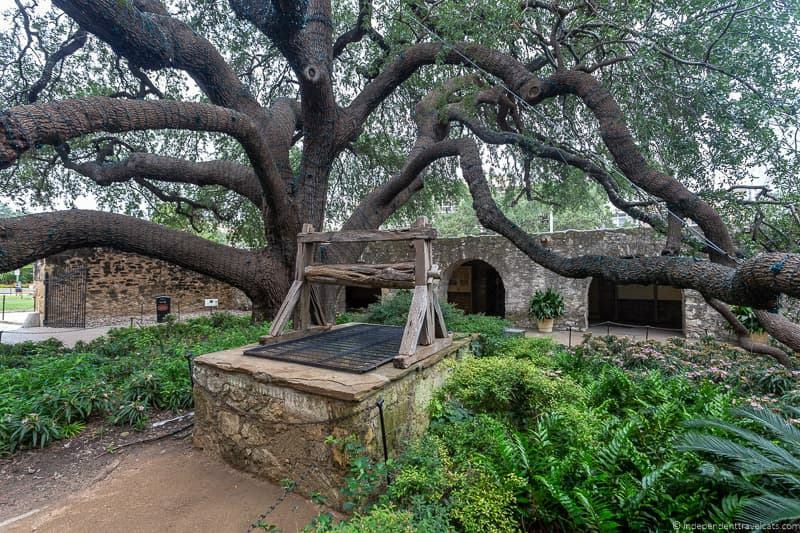 In 1718, the original site of the mission was built near San Pedro Springs, although this was a temporary structure. Less than a year later, the mission was moved to another site near the river, which was deemed less likely to flood. A few years later it was destroyed by strong winds from a Gulf Coast hurricane. The present location of the Alamo mission was chosen in 1724. The stone mission church was built around 1744, although much of this original structure was later damaged or destroyed in the 19th century. Over time, the original location expanded to include additional buildings and structures, primarily made of adobe. The final footprint of the Mission San Antonio de Valero took up about 3 acres, with farmland and pasture owned by the mission surrounding the complex. These structures included priest residences, adobe barracks buildings for soldiers, living quarters for Native American converts to stay, acequia (irrigation ditches), various workshops and farm related buildings such as a granary, and defensive structures, including walls, to protect against Apache raids. San Antonio de Valero was a successful and largely self-sufficient mission, which at its peak was home to over 300 converted Native Americans (mostly Coahuiltecan) and a herd of over 2,000 cattle. However, the late 18th century brought increased Apache attacks and a change in the law in 1778 that stated that all unbranded cattle belonged to the government. This law meant that the mission lost much of its resources and so its population rapidly dwindled. In 1793, the mission was secularized and soon abandoned. The complex remained unoccupied until 1803, when it was occupied by a Spanish military company. It was also around this time that it became known as The Alamo. It served a number of roles over the following years, including acting as a political prison and hospital. When Mexico gained independence in 1821, ownership of the complex was passed from the Spanish to the Mexicans. During this time, the Alamo was used as a garrison for Mexican forces, which remained the case until the end of 1835, when Mexican forces surrendered it to the Texian Army. During the Texas Revolution, the Alamo was besieged by 1,500 Mexican soldiers. 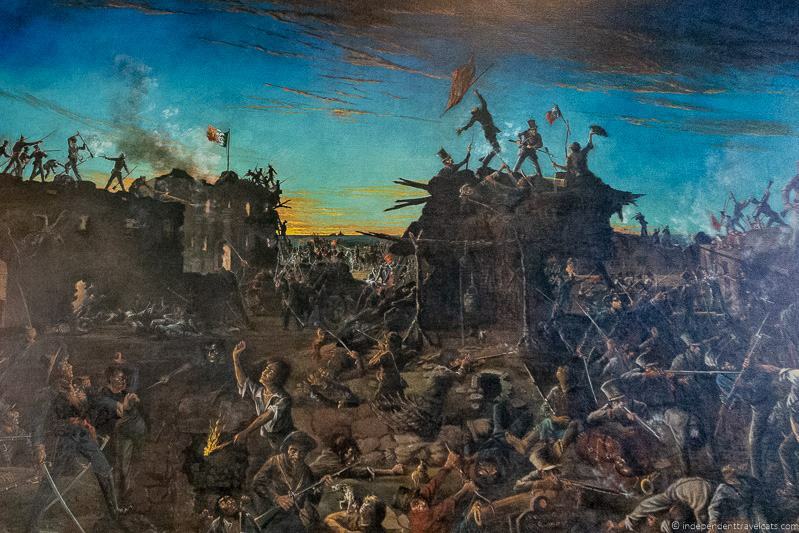 The Texians were surprised, outnumbered, and badly beaten during the Battle of the Alamo. The Mexican military took over the Alamo complex. Instead of accepting defeat, the bloody loss at the Alamo would be used as a motivating factor for the Texians to continue towards independence from Mexico. The battlecry “Remember the Alamo” is still well-known today. After the Texas Revolution ended, the Mexicans left the Alamo and Texas. Over the next 40 years, the complex was badly destroyed and rebuilt multiples times. It was used by the Texian, Mexican, American, and Confederate militaries. It was last used by the U.S. Army in 1876 who did some significant rebuilding of some of the structures. After the Army left, it was later split and sold in sections, one part being briefly used as a wholesale grocery store. The abandoned complex was in disrepair and further damaged by tourists and vandals. Although calls for preservation first began soon after the Battle of the Alamo, it wasn’t until the Daughters of the Republic of Texas, led by Adina Emilia De Zavala and Clara Driscoll, took an interest in the preservation of the building, that it began to be preserved and restored in the early 20th century. The Alamo is a historical site but it also serves as a shrine and memorial to those who died during the Battle of the Alamo. Today, the Alamo is currently owned by the State of Texas and it is operated by the Texas General Land Office. It became a UNESCO site in 2015 and is one of the most visited attractions in Texas. The Battle of the Alamo lasted from February 23rd 1836 until March 6th 1836, and it was a pivotal moment in the Texas Revolution (also known as the War of Texas Independence). We won’t recount the full Texas Revolution, but in brief, it was a series of battles fought between the Mexican government and the Texians (primarily Anglo Texans) from October 1835 to April 1836. Long running tensions between the Texians and the Mexican government led by Antonio López de Santa Anna, who had repealed the Mexican Constitution and were passing increasingly restrictive laws, led to a revolt by the Texians. The actual goals of the Texians varied, especially at the beginning of the rebellion, but many of the Texians wanted complete independence from Mexico. Many Tejanos (primarily Hispanic Texans) were also involved in the Texas Revolution and some fought with the Texians, like Juan Seguín. and some fought with the Mexican Army. Although many Tejanos were unhappy with the government’s policies, most did not want independence from Mexico as they feared either an Anglo-dominated independent state or becoming absorbed into the United States. The main commanders of the Texas Revolution were Sam Houston of the Texian Army and Antonio López de Santa Anna (often referred to just as Santa Anna) for the Mexican Army. Significant figures who fought on the Texian side included Stephen Austin, James Bowie, Davy Crockett, Juan Seguín, and William Barrett Travis. During this period, the Alamo was being used as a garrison for Mexican forces. However, the Mexican forces surrendered the Alamo at the end of 1835 to the Texian Army following the Siege of Béxar. Following their departure, the Alamo was left with only 100 men to defend it as the provisional government was in disarray and lacking troops and supplies. Colonel James Neill, the commander at the Alamo, saw the potential weakness of the Alamo as a defensible position in case the Mexicans decided to return. He asked the Texian government for additional help and supplies. Although some men were sent, including legendary frontiersmen David “Davy” Crockett and James Bowie, it was still far too few to be able to mount an effective defense. Neill left the Alamo in February 1836, in an effort to secure more men and provisions. The men of the Alamo were largely unprepared for the arrival of the 1,500 strong Mexican army under the command of the Mexican President, Antonio López de Santa Anna. On February 23rd, 1836, the siege of the Alamo began. 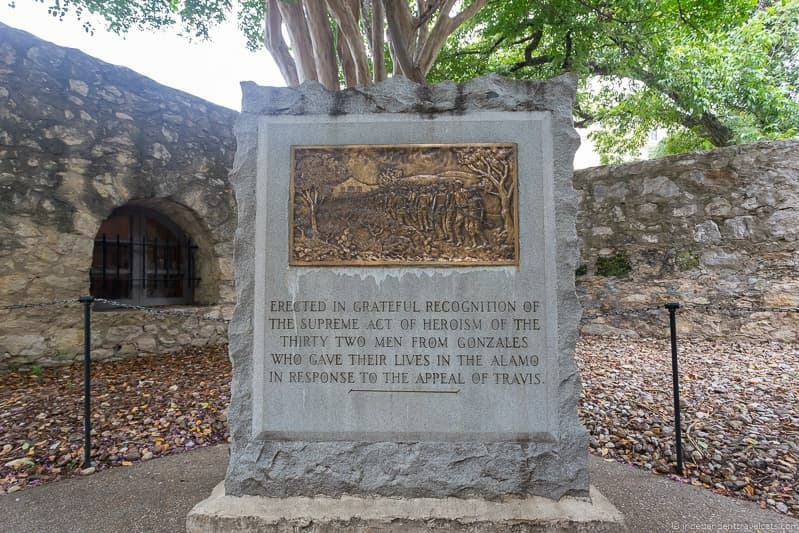 The majority of the battle took the form of a siege, with over 1,500 Mexican soldiers surrounding the Alamo, which had around 150 Texian defenders inside under the command of William Travis and James Bowie. The arrival of the Mexican army came somewhat as a surprise to the troops in the Alamo, and as a result it was poorly prepared for a siege, with limited food supplies and gunpowder. Although last-minute attempts to find food in the nearby houses did yield sufficient beef and corn to last a month. Throughout the 13 day siege, the Mexican army artillery fired into the Alamo and various skirmishes were fought, but there were no decisive engagements on either side, or significant losses. A change in weather part way through the siege caught both armies by surprise, as they were unprepared for cold. Attempts to send significant numbers of Texian reinforcements also failed, in part due to the cold weather, and also due to a lack of preparation. A small number of reinforcements did arrive, but not sufficient to change the outcome, with a total of around 250 Texians inside the Alamo by the end of the siege. Following 13 days of artillery bombardment, cold weather, and a lack of significant reinforcements, the Alamo defenders became worn down. This was not helped by the arrival of an additional 1,000 Mexican troops on March 3rd. On the evening of the 5th of March, the Mexican army ceased their artillery bombardment, and the resulting quiet meant that the majority of the exhausted Texians fell asleep. During this time, the Mexican army advanced into an attack position, and the attack on the Alamo commenced at 5:30 a.m. The ensuing commotion woke the Texians, but many were too late to reach their posts before the Mexican army was inside musket range. Over 2,000 Mexican soldiers charged the fortress, and whilst the Texian artillery was able to mount a strong defense, the sheer numbers of Mexicans were overwhelming. Despite repelling the first two major waves, the third wave of Mexicans was able to penetrate the Alamo. 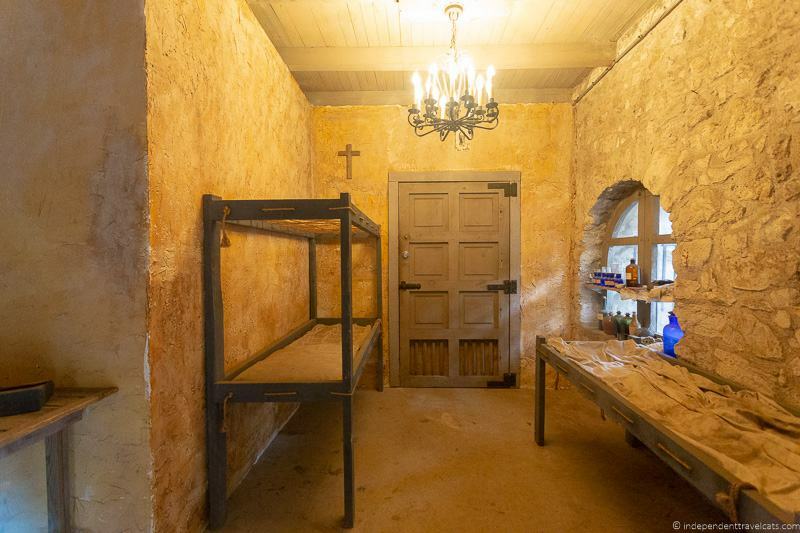 The surviving Texian defenders fell back to the barracks and chapel, the walls of which had holes carved into them to provide firing opportunities. Many troops were unable to make it to these positions, and the fighting around the complex was fierce. However, the sheer number of the Mexicans meant that a defeat was all but inevitable, and by 6.30am, the battle was over. The Texian Army is believed to have lost between 180 to 257 men. Although true numbers are unknown, the Alamo website states the following: “On March 6, 1836, 189 Texians and Tejanos gave their lives at the Alamo for Texas liberty”. All or almost all the Texian combatants were killed. William Travis, Davy Crockett, and James Bowie all died during the Battle of the Alamo. The Mexican Army was estimated to have lost between 400 and 600 troops during the Battle of the Alamo. There were a number of people who survived who had been inside the Alamo during the battle, including military couriers who had left the Alamo before the siege, servant and slave noncombatants, and women and children. A well-known survivor is Susanna Dickinson and her infant daughter, whose husband was killed during the battle, who gave a number of oral accounts of the battle. It is believed that Santa Anna may have released these people so they would go on to tell the story of the Alamo and the invincibility of the Mexican army. He believed this defeat would demoralize the people and put an end to the Texian Revolution. In fact, the opposite happened, and the Texian Army became more determined after the defeat to make victory their goal at all costs. The battlecry “Remember the Alamo, Remember Goliad!”, became the rallying cry of the Texan army as they fought for independence from Mexico. The phrase is still widely known today, although it is usually shortened to “Remember the Alamo!”. Poor Goliad. Goliad, site of the second battle in the Texas Revolution as well as a subsequent massacre, is relatively forgotten in comparison to the Alamo. But for those interested in Texas Revolution sites, Goliad should definitely be on your radar. It was actually during the Battle of the Alamo that the Texians held a political convention and declared themselves an independent republic from Mexico on March 2, 1836. 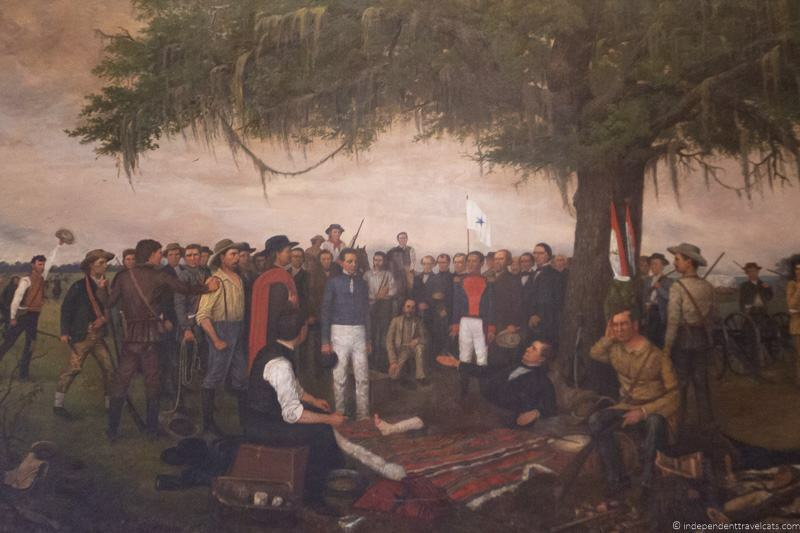 Although defeated at the Battle of the Alamo, the Texians would eventually be victorious over the Mexicans who would retreat and surrender after the Battle of San Jacinto in April 1836. The Texas Republic would eventually become part of the United States of America in December 1845. Fighting with Mexico would continue off and on until 1848 when Mexico signed the Treaty of Guadalupe Hidalgo recognizing Texas secession and granting significant amounts of land to the United States. Although The Alamo was a lot of things in its long history, The Alamo is most famous today because of the Battle of the Alamo in 1836. Despite being a brutal loss on the Texan side, it led to a surge in the size and morale of the Texan army. For Texans, the Battle of the Alamo became a symbol of heroic resistance by brave heroes in their struggle for independence. Today it is an important historical site as well as a sacred site and memorial to those who died at the Battle of the Alamo. 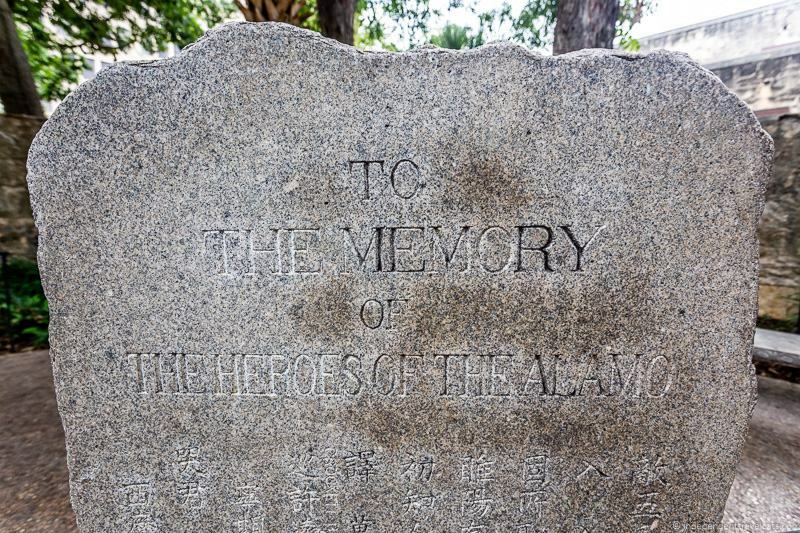 The Alamo website describes it as “the Shrine of Texas Liberty and hallowed ground”. 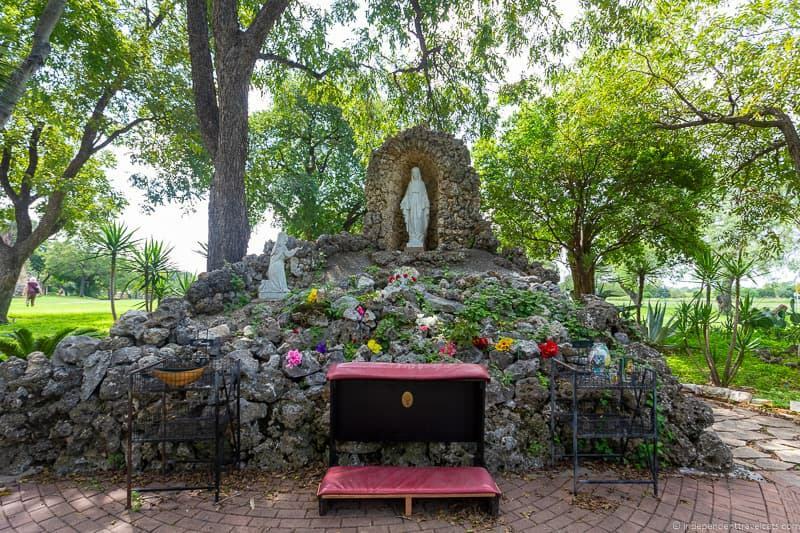 Although it is best known as a battlefield site today, it is also of course important in terms of Spanish mission history as it was the first mission established in the San Antonio area. 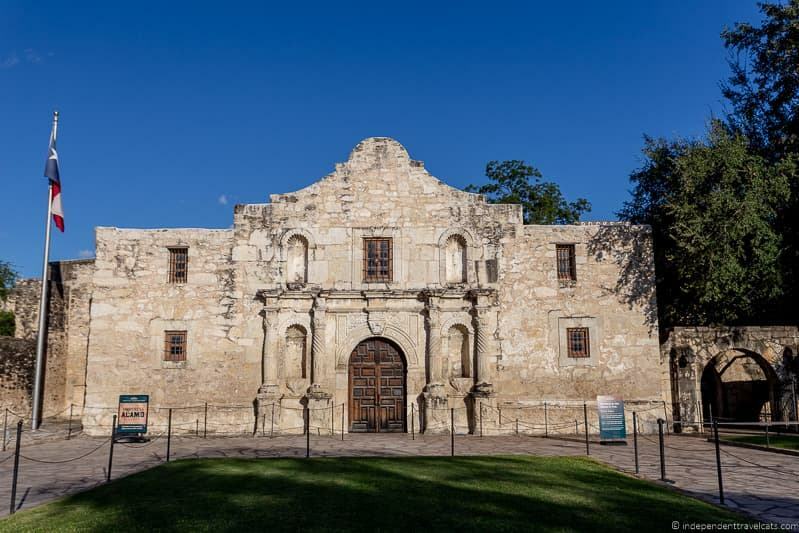 Today the primary purpose of The Alamo is a visitor attraction, where you can learn about the history of the buildings, the Texas Revolution, and of course the story of the Battle of the Alamo itself. It is one of the most popular things to do in San Antonio. The Alamo, particularly the courtyards and gardens, is also used as an event space and hosts various events throughout the year which are usually open to the public. Texas Revolution – For military history consider Texian Iliad by Stephen Hardin. For a wider history of Texas’ struggle for independence and early years as a republic, consider Lone Star Nation by H.W. Brands. Battle of the Alamo – There are lots of books out there, consider The Blood of Heroes by James Donovan or A Time to Stand by Walter Lord. Looking for something more interactive or to keep younger readers interested, consider this 2018 book that using 3D technology and augmented reality. Visiting the Alamo – Look up all the practical information (opening times, guidelines) and book tours online on the official website for the Alamo. The Alamo is currently free for anyone to visit and it takes a lot of money to preserve, protect, and operate the site. You can help preserve The Alamo by making a visit and purchasing on-site services and products, whether it is renting an audioguide, booking a guided tour, or purchasing souvenirs from the gift shop. You can also help by giving a donation during your visit or you can donate online or by mail from anywhere in the world. Below we’ll share everything you need to know to visit The Alamo in San Antonio and make the most of your visit. The Alamo is located in downtown San Antonio within Alamo Plaza. The Alamo is found in downtown San Antonio, and it is very easy to get to from most parts of the city. 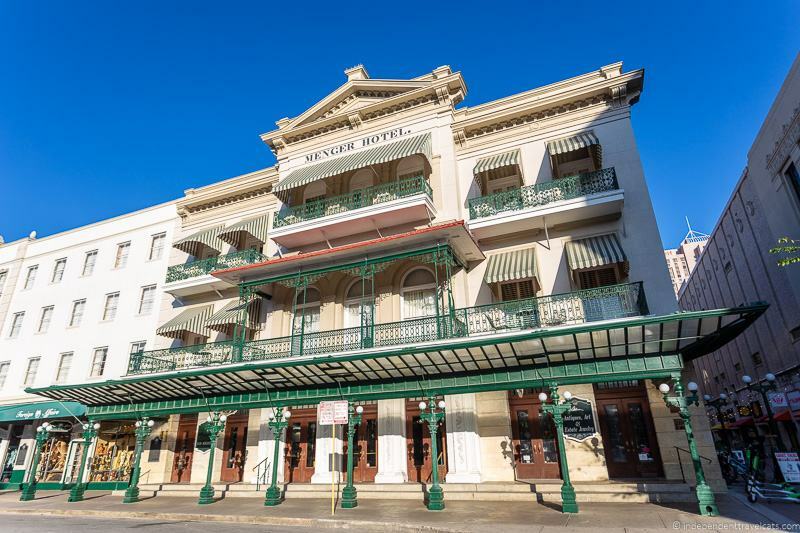 It is within walking distance of many of the downtown area hotels (including the Hotel Gibbs and Menger Hotel) and attractions in San Antonio. You can also get around San Antonio using public transport and several buses stop within a short walk of The Alamo. You can see the local public transit network schedules and information here. The city’s hop-on hop-off sightseeing bus also stops at the Alamo. There are also taxis and Uber available in the city. The Alamo doesn’t have its own parking, so you will need to find parking nearby in downtown San Antonio. This being a larger city, there isn’t much available free parking, so you’ll probably need to find a paid parking lot or garage. Although there are super close parking locations such as Central Parking at 300 Avenue East (2 minute walk) these tend to be more expensive than the city owned lots. 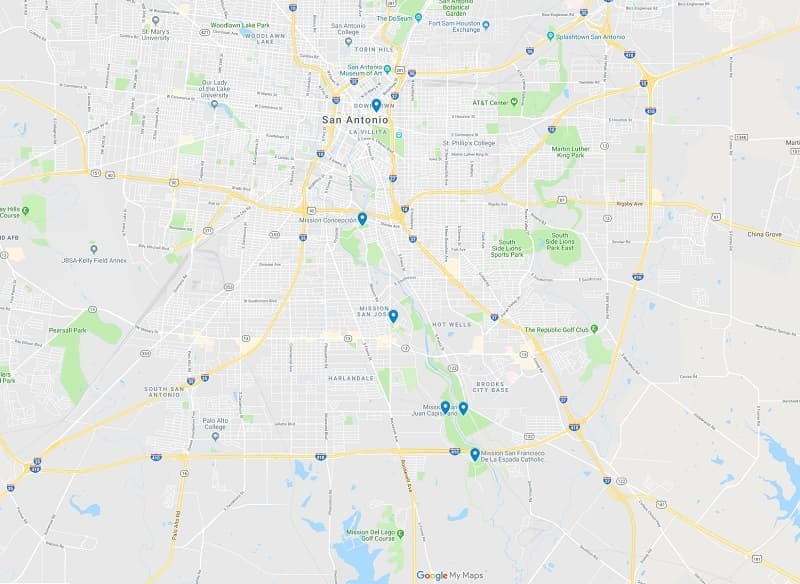 We recommend the Houston Street Garage at 240 East Houston Street (6 minute walk) or the Houston/Nolan lot (6 minute walk), which is found under Interstate 37 on East Houston St. You can see more parking options in San Antonio here. Note that visitors with a valid U.S. disabled permit can park for free for short term visits at the downtown parking facilities run by the City of San Antonio. We’d recommend walking or taking a bus to get to The Alamo rather than driving if that is an option as the downtown area is best explored on foot. The Alamo is free to visit! You can go inside the church and walk around the grounds, as well as visit all the various buildings which are open to the public. There is a fee if you wish to rent an audio guide or take a guided tour. The guided tours (as of January 2019) cost $15 per person, and audio guides are $7 per person. Military and veteran discounts are available. Both the audio guides and guided tours can be booked in advance, and we would recommend booking guided tours in advance to ensure you get the desired time slots as they do fill up in busier months. More on this below. We highly recommend taking either the guided tour or using the audio guide to make the most of your visit to The Alamo. Whereas there is information posted around the Alamo to help you understand what you are seeing, a tour in the form of an audio guide or actual tour guide will give you lots more context and information to help you learn about the history and events that happened here. It’s also a great way to support the ongoing restoration and preservation of the site. If you choose to get an audio guide (available in 5 languages), you can either book this online in advance, or turn up and pick one up on the day. They seemed to have a large number of these available when we visited, so advance booking might not be necessary. But if you are visiting on a busy day you might choose to book in advance to be sure to get one. For guided tours, these run on a scheduled basis and last around an hour. Tours run throughout the day, and while walk up slots are kept open on a first come, first serve basis, we highly recommend booking these online in advance so you can get the time you want and don’t have to wait. If you want to book your tour online, guided tours need to be booked at least 24 hours in advance of the tour time. So make sure you leave plenty of time to book so you are able to get on the tour you want. If no tours are showing as available, you will want to turn up at the tour booking desk outside the main entrance at opening times (9am) to book onto a tour for that day. There are also Young Texans tours designed for children age 5 to 12 and their families that you can book online as well. Private tours and after hours tours can also be requested and booked in advance. It is recommended that you book these at least 2 weeks in advance of your visit. You can read about the various tour options and book online here. There is a set of rules of conduct for visiting The Alamo given its status as an important historical monument as well as a church, memorial, and shrine. Guests are expected to behave respectfully, remove hats while visiting the church, and to dress appropriately. Guests are not allowed to take photographs or videos within the church or Long Barracks, use cell phones in the church (although you can elsewhere in the complex), or to bring in scooters, bicycles, or dogs (except guide dogs). 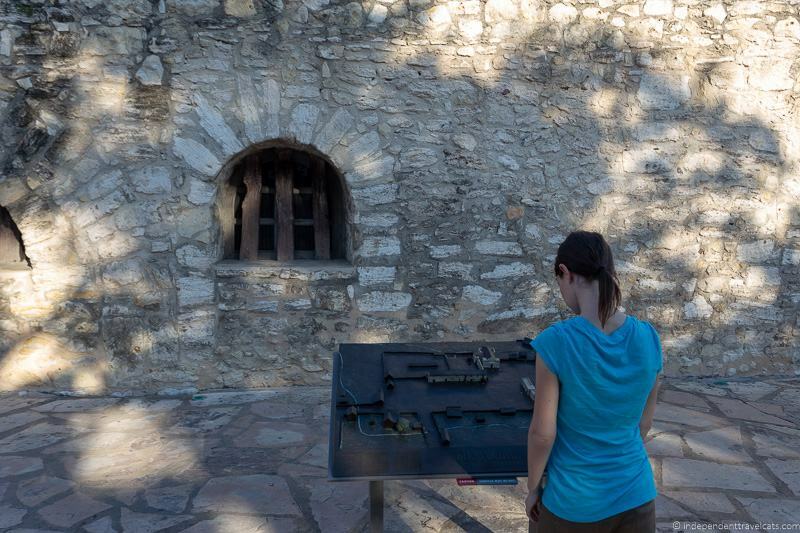 There is a lot to see at The Alamo, and we’d suggest you plan to visit for at least 1 hour. 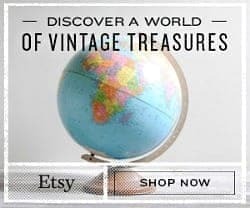 Those really interested in the history of the site should allot 2 hours in order to have enough time to see everything you might be interested in. If you have seen fictionalized films about the Alamo and the Battle of the Alamo, be prepared to find something different and not nearly as large or elaborate. Most films’ depictions of The Alamo took a lot of liberties and have a lot of historical inaccuracies, leaving some guests disappointed with the reality. Note there are plans to make significant changes and renovations to the site in the next few years, including expanding the site, restoring current buildings, opening a new museum, and offering a digital battlefield experience. You can read more about that here. The church at The Alamo is the most recognizable building in the compound, and this is where the majority of visitors will start their visit. You can see the exterior of one side of this building from the Alamo Plaza. Construction on the church began in 1744; however, it was damaged and destroyed a number of times and much of the current structure dates from much later. The structure was intended to be highly decorative with a bell tower and dome; however, these features were never built. 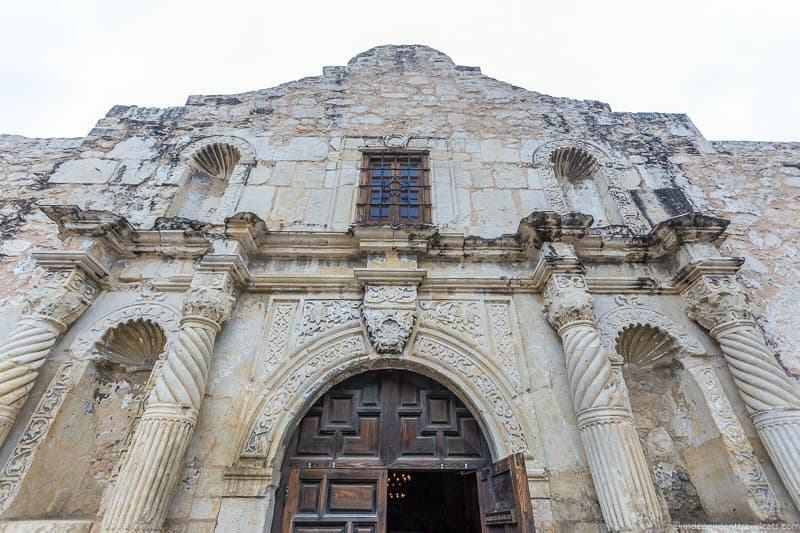 Although this facade is iconic, what we see today was not what it would have looked liked to either the Spanish missionaries or the folks who fought during the Battle of the Alamo. Parts of it, including the iconic “hump” at the top, was constructed by the U.S. Army in the 1850’s. In fact the first known roof over the main part of the church was completed by the U.S. Army in the 1850’s. Since the chapel was never fully completed, it is thought that it may never have actually served as a church. People of the mission are believed to have held services in the sacristy area of the church while the rest of the building was under construction. The church interior is relatively small. The main parts of the church are the nave, transept, and apse and there are a number of plaques and memorials are the apse. There are also some smaller rooms, including the confessional, baptistry, and sacristy. There is also a room that was used as a burial place for the monks. 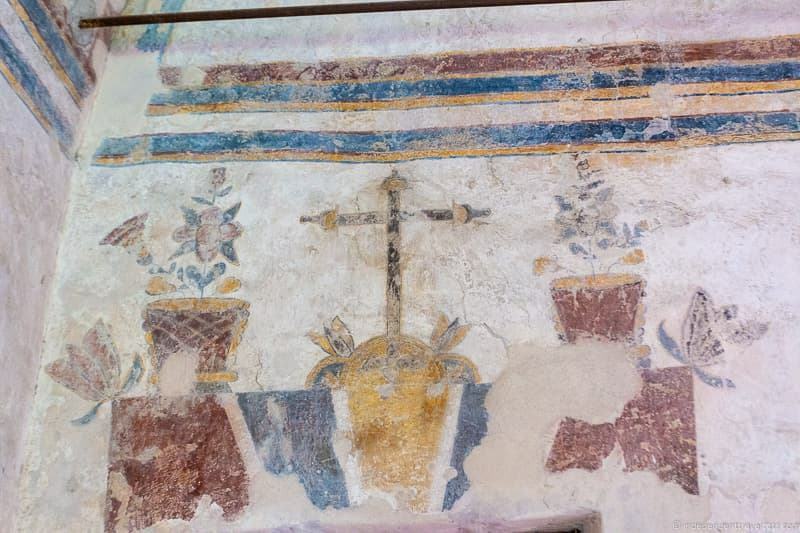 Some of the interior walls were decorated with frescos and some traces of these can still be seen today. You can also see signs of the fighting during the Battle of the Alamo. Photography is not allowed in the church and visitors are requested to remove their hats and refrain from using cell phones or being loud. When you exit the church it’s suggested you head to the Alamo Film and Long Barrack Museum. On the way, you will pass through the walled Convento courtyard, home to a large well. This was built when the Alamo was still a mission, and was in use during the Battle of the Alamo. There is a 17-minute film about the history of the Alamo and the events leading up to and surrounding the battle itself playing in the film theatre, which can be found in the Long Barrack Museum (or alternatively the Alamo Arbor). We recommend watching this before your visit to the Long Barrack Museum. It plays continuously throughout the day, and is free to watch. The Long Barrack Museum was the original home of the Spanish missionaries, a 2 storey convent which housed their living quarters and offices. It is the oldest building in San Antonio, being built around 1724. It was expanded over time and later used by various militaries. During the Battle of the Alamo, it was the site of a last stand for many of the garrison’s soldiers, as they withdrew here when the courtyard was overcome. Today, the Long Barrack serves as a museum which tells the story of the Alamo, and is home to many important artifacts and weapons from the battle. These include the letter from Colonel Travis pleading for reinforcements, the sword Travis wore when he was killed, and Davy Crockett’s shot pouch. There is also a list of all the known defenders of the Alamo. Photography and videography is not allowed within the Long Barracks building. Just next to the Long Barrack museum is the Cavalry Courtyard, which is home to several cannons which were used in the Battle of the Alamo. It’s also home to a beautiful live oak tree, planted in 1914. Across from the Long Barrack Museum is the Wall of History, which has a mural that provides a full account of the 300 year-old history of the Alamo. This was installed in 1997. 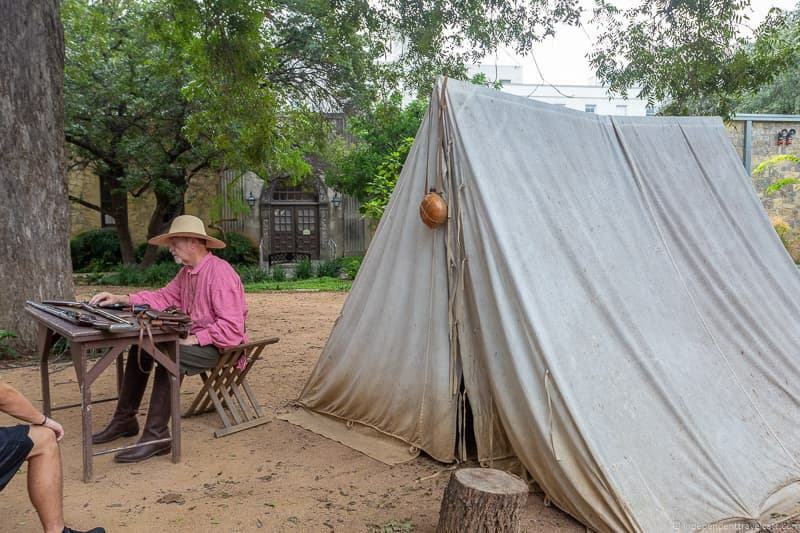 In the Living History Encampment you can learn about life in the time of the Alamo, with demonstrations given on a variety of topics, from weaponry to food. Regular demonstrations include activities like weapon firing, period clothing demonstrations, fire starting, cooking, and leather making. These change daily and are free to watch. The Alamo Special Exhibit Hall is home to different and changing exhibits. In February 2018, the Fortress Alamo Exhibit opened, which details the military history of the Alamo. The Alamo has restrooms and water fountains on site. There are no cafes or restaurants at The Alamo, but there are vending machines with snacks and drinks on site. There are a number of different dining options within a few minute walk of the Alamo. There is also a large gift shop, which is currently located in the 1937 Texas Centennial Museum building. Originally, this was built to honor the 100th anniversary of Texas independence. As the Alamo is supported by donations and gift shop sales, a purchase here will help ensure future generations can also enjoy visiting. All public areas of the Alamo are accessible to wheelchairs users; however, the historic flagstone floors are uneven in some of the structures and can present difficulties. Those in wheelchairs should seek assistance from Alamo staff about which doorways and paths are accessible. There are wheelchair accessible toilets located within the site. There are a number of sites that are of interest to historians and archaeologists outside of the current site owned by the State of Texas and operated by the Texas General Land Office. The original Alamo Mission complex was about 3 acres in size and the current site only occupies a small amount of that space. The entire Alamo Plaza area would have been part of the San Antonio de Valero Mission and walls would have stood protecting the church and other buildings. 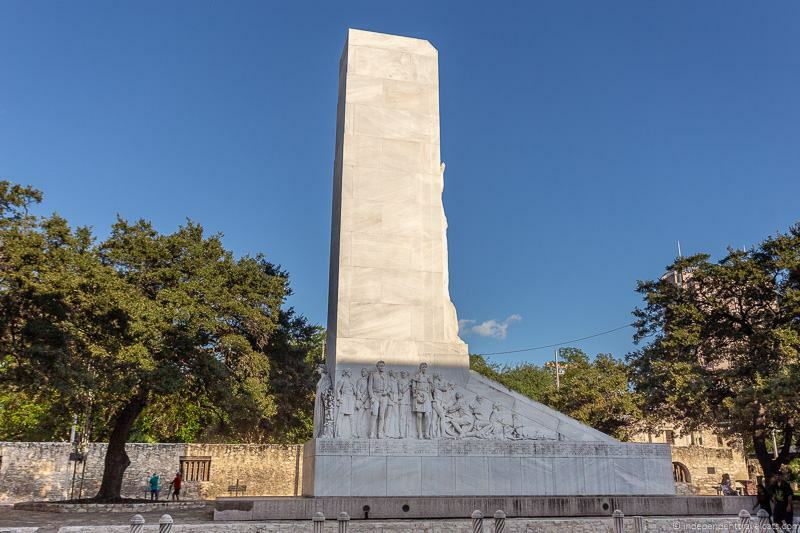 Alamo Cenotaph – Also known as the Spirit of Sacrifice, the memorial is situated just outside of the Alamo. It includes a list of names of most of the people who fought in the Battle of the Alamo on the Texian side. A few names, which were not known when it was built in 1936, are planned to be added. Alamo Walls – There are markings in some places on Alamo Plaza that denote where walls would have been in front of the church. There is also a burial site. 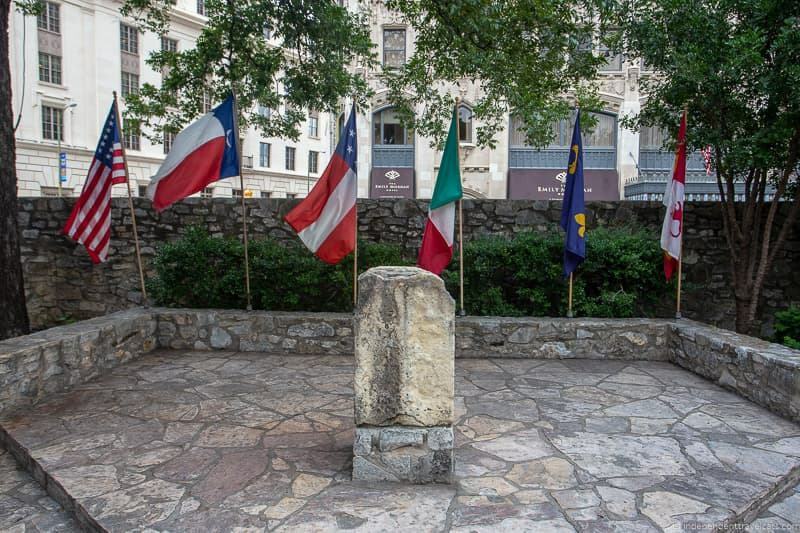 Commerce Street – Along Commerce Street there are plaques located near where it is believed that bodies of some of the Alamo defenders were burned on funeral pyres after the battle. There is also a plaque at the location of the former footbridge that was in use during the Battle of the Alamo. Ashes of the Alamo Dead – Inside the San Fernando Cathedral there is a marble coffin that is said to include the ashes of some of the defenders of the Battle of the Alamo, including Bowie, Crockett, and Travis. There are lots of doubts about the veracity of this and lots of debates about where the bodies or ashes were buried. But the church is well worth a visit anyway! Original Sites for the San Antonio de Valero mission – The Spanish mission was moved at least twice before it ended up at its present site. Although experts know broadly around where these would have been, the exact locations are unknown. However, both the Chapel of Miracles and San Francesco Di Paola Church are possible sites near which the original mission may have sat in 1718. The second location in 1719 may have been in La Villita or where St. Joseph’s Catholic Church now stands. See this article for more information about current theories. If you want to dig deeper to be able to visualize and find lots of Alamo related sites, we’d recommend either using a book like The Alamo Story & Battleground Tour, or hiring a private guide who is knowledgeable about The Alamo. The film Alamo: Price of Freedom was created for IMAX in 1988. It has been running in San Antonio ever since and is still popular. This is a good film to see to get a good overview of the Battle of the Alamo before you visit. This is an easier way to get kids excited for a visit, although note due to the violence it may not be suitable for younger children. The film is 48 minutes long and is shown several times a day at San Antonio’s IMAX Theater located in the Rivercenter Mall. The mall is about a 6 minute walk from The Alamo historical site. You can see show times and ticket information here. Tickets to the film are included for free if you have the San Antonio Super Saver pass. The Battle for Texas: The Experience is an interactive visitor attraction and museum on Blum Street off Alamo Square that is not associated with the operators of The Alamo historical attraction. The Battle for Texas attractions receives mixed reviews with many saying it is worth visiting before going to The Alamo. We haven’t been so can’t comment, but I’d read recent reviews to decide if it sounds like something you’d want to visit or not. It is one of the attractions included on the Go San Antonio Card. Visit off-season. Summer is the busiest time fo the year at The Alamo and you’ll find fewer travelers here at other times of year. Although note that school groups visit throughout the year. Go early. Be there when it opens in the morning to be one of the first ones in before it gets too crowded. See the church first and then the Long Barracks as these are the two busiest areas. If you can’t go early, try going late. Go a couple of hours before closing when most people have already visited for the day. Book a private tour or an after-hours tour. As mentioned earlier, The Alamo staff run private tours during the day as well as limited evening group tours after the site has closed to the general public. These are limited in number and must be booked well in advance (normally 2 weeks or more). Rent an audio guide. Having an audio guide can help you tune out the noise and crowds around you. You’ll also get more out of your visit. If you are traveling during a busy time of year and don’t have a lot of control over your schedule, don’t worry too much. Just be sure to leave plenty of time and have a bit of patience. Be sure to take water and sun protection and take the visit at your own pace. There are lots of lodging options available in San Antonio from budget to luxury, and you can search for available lodging options in San Antonio online here. If you want to stay near the Alamo (and many of the other city center attractions), you’ll want to look at properties in downtown San Antonio. If you are looking for a historical hotel, there are several in this area. Hotel Gibbs Downtown Riverwalk – This 3-star hotel was originally a 1909 office building before being converted into a mid-range hotel with a restaurant, bar, and fitness center. We loved the full breakfast buffet, friendly staff, well-sized rooms, and great location. Located about a 1 minute walk from The Alamo. Menger Hotel – A historic 4-star luxury hotel that opened on Alamo Square in 1859. The ground it sits on was part of the battlefield during the Battle of the Alamo. We did not stay here but had a lovely dinner in the hotel restaurant. 1 minute walk to the Alamo. Best Western Premier Hotel – This hotel is one of the best rated mid-range hotels in downtown San Antonio. Hotel offers an indoor pool, fitness center, 24-hour front desk, and complimentary continental breakfast. It is located about a 10 minute walk from The Alamo. The Crockett Hotel – This 3-star historical hotel was built in 1909 and is named after Davy Crockett as the hotel stands where Davy Crockett and other Texians once stood while defending the Alamo. Hotel offers comfortable rooms, a bar, 24-hour desk, free breakfast, a swimming pool, and allows pets (for a fee). The St. Anthony Hotel – This 4-star luxury hotel is a visitor favorite and was the first luxury hotel in the city when it was built in 1910. It features a heated outdoor swimming pool, fitness center, restaurant, bar, room service, and large-screen TVs in each room. It is about a 3 minute walk from The Alamo. Red Roof Inn – This is a good-value chain motel offering clean rooms, an outdoor pool, 24-hour front desk, and basic amenities. A good option for those traveling on a tighter budget but still want to be within the heart of downtown. A 7 minute walk from the Alamo. If you are looking for a room or apartment, you may also want to check out local Airbnb listings here. There are lots of things to do within walking distance of The Alamo so it is easy to spend a full day in this area. San Antonio River Walk – A lovely pedestrian network of walking paths along the San Antonio river that connects many attractions. Also known as the Paseo del Río. Boat trips can be taken along the river as well. 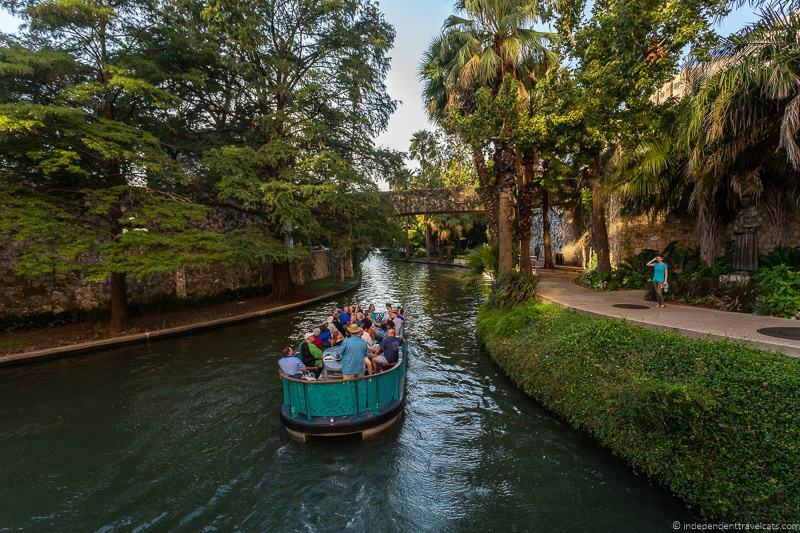 Read our San Antonio River Walk guide for lots of things to do and tips. Ripley’s Believe it or Not – A museum of weird and quirky stuff. Shops at Rivercenter – A large shopping mall with stores, restaurants, and an IMAX theater (where the Alamo: Price of Freedom film is shown). The San Antonio River Walk runs through it. San Antonio Fire Museum – A museum of firefighting related objects and history in the former Central Fire Headquarters built by the Works Progress Administration in 1938. Artifacts date from mid 19th century to present. The Buckhorn Saloon & Museum – A saloon plus a large museum that includes a huge collection of taxidermied wildlife from around the world, Texas Ranger memorabilia, illusion games, carnival exhibits, and wax figures. If you don’t want to visit the museums, you can just grab a beer in the Old West themed saloon. Briscoe Western Art Museum – A museum exhibiting art reflecting the history & culture of the American West. La Villita Historic Arts Village – An art community in a historical area of downtown where there are a number of art galleries and gift stores selling jewelry, crafts, souvenirs, and art. San Antonio has plenty of other attractions as well. You can see our guide to things to do in San Antonio for ideas of how to spend your time. If you are planning to visit several attractions you may save money using one of the city passes. These include the Go San Antonio Card and the Super Saver Passes. As well as the Alamo Mission, the Spanish built several other Catholic missions around San Antonio in the 18th century. In addition to The Alamo, there are four other missions you can visit in the San Antonio area. These four missions are part of the San Antonio Missions National Historical Park, along with the Espada Acequia (a.k.a. Piedras Creek Aqueduct). The Alamo plus the sites of the San Antonio National Historical Park form a UNESCO world heritage site. 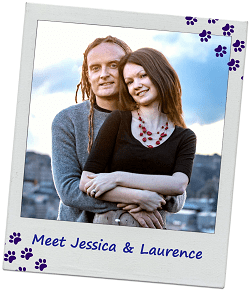 As the missions are spread out, you will want to plan in advance how you want to visit them. You can either spend a whole day visiting them as part of a pleasant day of walking or biking, or you can use public transit, drive, or book a day tour. Note that San Antonio gets very hot in the summer months, so we’d advise against walking or cycling in these months unless you are used to activity in high heats and are suitably prepared with plenty of drinking water and sunscreen. Water fountains are available on the trails so bring a reusable water bottle. If you have your own car, certainly one of the easiest ways to get between the missions is to drive. The route is well signposted, and there is free parking at each Mission location. The distances by car are not great, so you should be able to get between each Mission in 10 minutes or less. If you feel like an active day out, you can get between the Missions on a dedicated pedestrian / cycle path, which is a part of the San Antonio’s River Walk. This section of the River Walk is known as the Mission Reach, and was specifically designed to allow for foot and cycle access between the Missions. It’s open daily from dawn to dusk. You can take the River Walk all the way from the Alamo to Mission Espada, and this would make for a full day of walking if you choose to do the whole route. As it’s a one way route, we’d advise perhaps walking in one direction, and then taking the bus or a taxi back. Another popular option for getting between the missions is to ride a bike, which you can do either along the shared Mission Reach River Walk, or you can follow the on-street bike route, which runs from the Alamo all the way to all the missions. You don’t need your own bike as you can take advantage of the San Antonio city-wide cycle scheme, known as B-Cycle. There are B-Cycle points all around the downtown, as well as at each mission on the route, so you can drop your cycle off at each point and then pick it up again when you are finished at each mission. The #40 public bus service runs from downtown San Antonio to all the Missions on the route, with stops at each Mission. One of the stops is near The Alamo so you can take it to all 5 of the missions in San Antonio. For times and pricing information, visit the VIA Metropolitan Transit website. Another good option for visiting the Missions is to take a tour, which will include transport and a tour guide to give you context and information about what you are seeing. Here’s a good value half day guided tour for example, which covers all the missions and means you don’t have to worry about transport at all. Tour includes round-trip transportation from downtown. Of course, you can also arrange a taxi or other ride service to get between the Missions in San Antonio. If you do this, we can certainly recommend also taking the River Walk between at least two of the missions, as it’s a lovely walk. Each of the four missions in the park are around 2.5 miles (4 km) apart, and the total distance between the four missions is about 6.5 miles (10.5 km). The first mission in the park, Mission Concepción, is around 2.5 miles (4 km) south of the Alamo and downtown San Antonio. Here is a map of the Alamo and the four missions of the San Antonio Missions National Historical Park. You can use this map to help visualize where they are located and help plan your route. Admission to all the missions on the San Antonio Mission trails is free. Donations are accepted and appreciated at each of the mission locations. The four missions are normally open to the public for visiting from 10:00am to 5:00pm (10:00 to 17:00) daily. The park’s Visitor Center is located at Mission San José and is usually open from 9:00am to 5:00pm. The sites are closed on some holidays such as Thanksgiving Day, Christmas Day, and New Year’s Day. You can check the latest opening hour information here. All the missions are staffed during regular visitor hours with both staff and volunteers. The park’s Visitor Center is located at Mission San José which has museum exhibits, a video, bathrooms, and information. It is a good place to get further information about the park and to help plan your visit. There are no restaurants within the park or places selling food or drinks. There are water fountains. Toilets are available at all sites during opening hours. Guided tours are regularly offered by staff at Mission San José and these are also sometimes offered at the other missions as well depending on staff availability and visitor interest. If you would like a guided tour of all four missions (plus transport) I’d take a look at this small group tour option. For those traveling in a wheelchair, parts of some sites may not be wheelchair accessible but the main sections of most of the missions are accessible to wheelchair users. Wheelchairs are available for loan on request. You can read more about accessibility here. There is a bookstore and gift shop located within the Visitor Center at Mission San José. 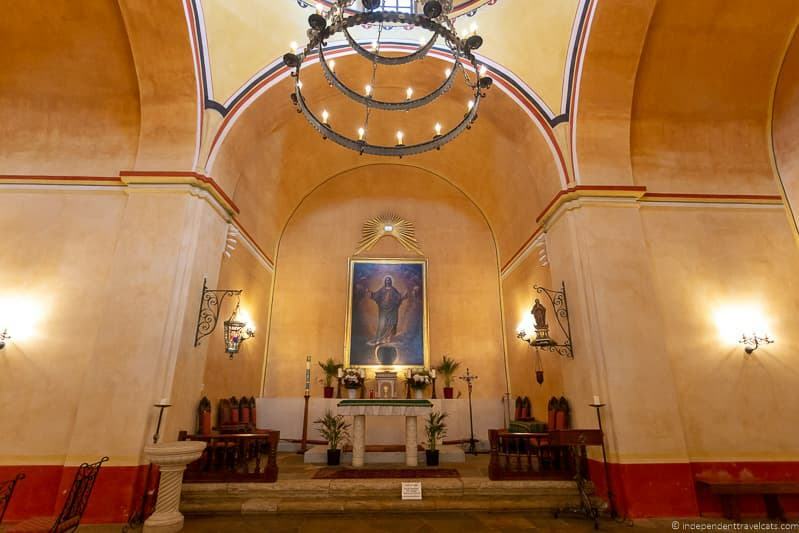 Yes, regular Roman Catholic masses and religious ceremonies are performed at each of the four churches that are part of the San Antonio Missions National Historical Park. You are welcome to attend worship services at the churches. Check the Mission Concepción mass schedule here, Mission San José mass schedule here, Mission San Juan Capistrano here, and Mission San Francisco de la Espada here. There are four missions which form the San Antonio Missions National Historical Park plus the Espada Aqueduct which was built in 1731 and is still in use. Mission Concepción was originally founded by Franciscan missionaries in East Texas in 1716 as the Nuestra Señora de la Purísima Concepción. It was moved to its present location in 1731 and the stone church was dedicated in 1755. The short Battle of Concepción, part of the Siege of Béxar, took place on the mission grounds on October 28, 1835 between the Mexican troops and Texian rebels under the leadership of James Bowie and James Fannin. The fighting was brief, about 30 minutes, and the Texians forced the Mexicans to flee. This was one of the first engagements of the Texas Revolution. Mission Concepción consists of a sanctuary, convento, and granary. The interiors of the church originally had bright frescoes and traces of these can still be seen, and a few of these frescoes have been restored in recent years. There is also a grotto outside. It is considered the oldest unrestored stone church in the United States, and one of the best preserved of all the missions in San Antonio. It is an active church. Mission San José was built on this location in 1720 after the San Antonio de Valero mission become overcrowded. The church, which still stands, was constructed in 1768. It was founded by Father Antonio Margil, and served as a mission until 1824. The complex fell into disuse after its life as a mission ended, but it was occasionally used for military purposes. The WPA helped restore and rebuild the site in the 1930’s. The original church structure still stands along with a restored granary. The mission walls and Indian quarters were re-built. Today, the church is in active use, offering regular masses and worship services. One of the best known features of the church is the Rose Window that was sculpted in 1775. The window is considered to be one of the finest examples of Baroque architecture in North America. 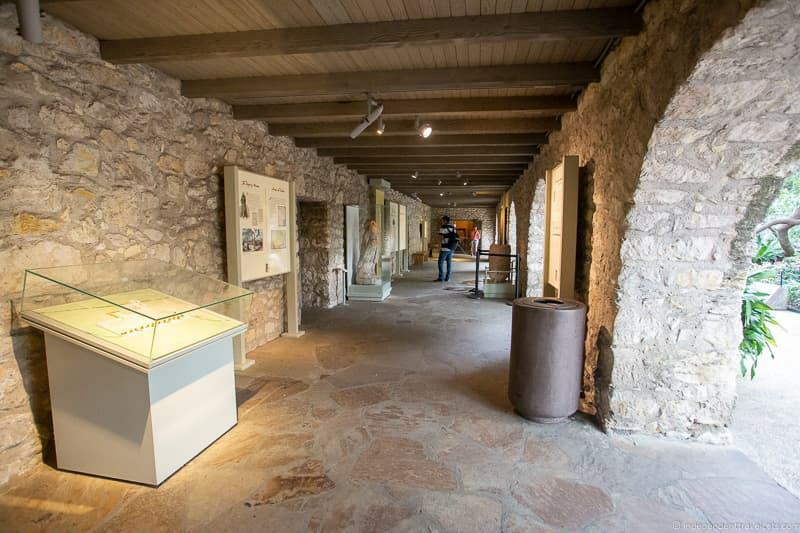 The San Antonio Missions National Historical Park Visitor Center is located adjacent to Mission San José and here you’ll find a small museum, a video, exhibits, and visitor services. We recommend starting your San Antonio Mission journey here as the Visitor Center gives a lot of historical context and helpful information. If you only have time to visit one mission within the park, we’d recommend this one. Mission San Juan Capistrano was originally founded in 1716 in East Texas. The mission was relocated to San Antonio in 1731, and the present day stone church was built in 1756 along with a friary and granary. This mission was not as successful as the other San Antonio mission, primarily because the land granted was not sufficient for growing enough crops or raising enough cattle. The Mission San Juan Capistrano was secularized in 1794 but missionaries continued working here until 1824. Religious services began again in 1840 and the church has been used almost continuously from that period to the present. It remains an active church. There is a nature trail called the Yanaguana Trail here that runs along the river. The trail is paved and mainly flat and ADA accessible. Dogs are not allowed on the trail for protection of local wildlife. There is also a community farm located on the grounds that is used to supply the local food bank. The origins of the Mission San Francisco de la Espada date back to 1690 when the San Francisco de los Tejas mission was founded near Weches, Texas. This mission was relocated several times before finally becoming established in San Antonio in 1731, where it was renamed San Francisco de la Espada. The current stone church was built in 1756. In 1794, Espada was secularized but missionaries and people continued to live here. However, the community declined and many of the buildings were damaged or destroyed by Comanche raids or fire. The chapel however survived. This is the best place to see the Espada Acequia, a 18th century aqueduct. It was built by the Franciscan friars to irrigate the mission’s farm lands and is still in use by local residents. Learn a little about the Alamo and the Spanish colonial missions in advance to make the most of your visits. 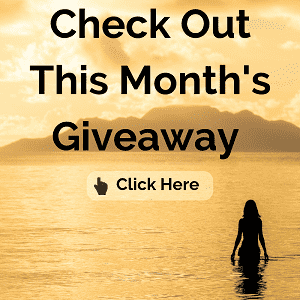 This may be just reading this blog post, reading a book, or watching the Alamo: Price of Freedom IMAX film. It gets hot in San Antonio, especially in the summer months (above 100 degrees F), be sure to be prepared as the heat can really affect unprepared visitors. Bring water, sunscreen, and sun protection. The missions and historical sites are obviously not air-conditioned so be sure to take plenty of breaks, especially if traveling with children or older adults. Check latest opening times and dates online before you visit. 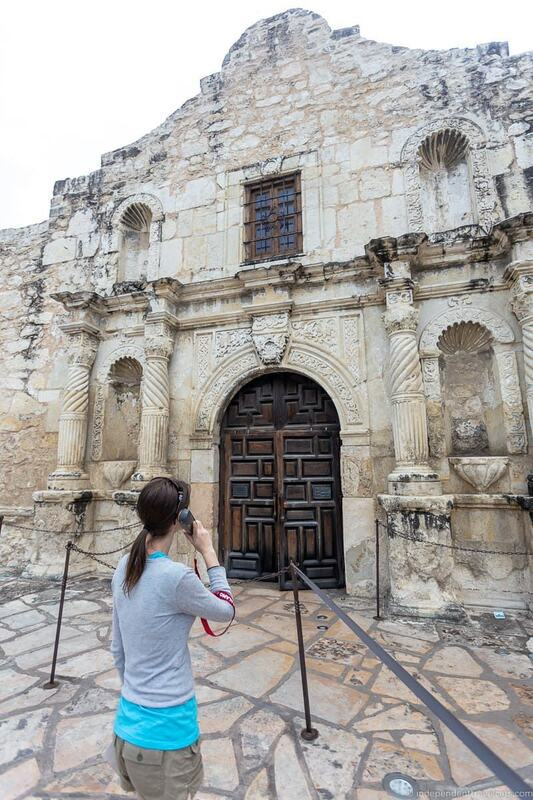 For the Alamo, we recommend visiting either around opening time or later in the day. 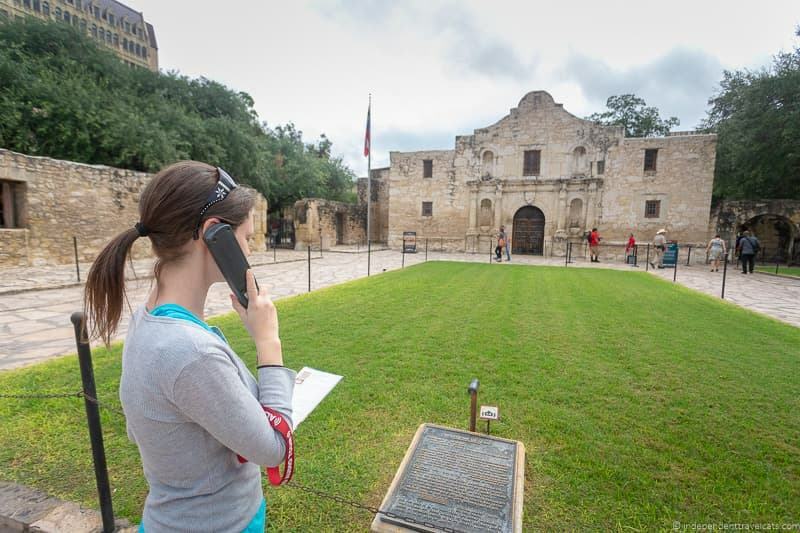 We recommend getting an audioguide or taking a guided tour when visiting The Alamo to get the most out of your visit. If you are interested in a tour of The Alamo, be sure to book any guided tours in advance of your trip to ensure you get a tour during your visit. 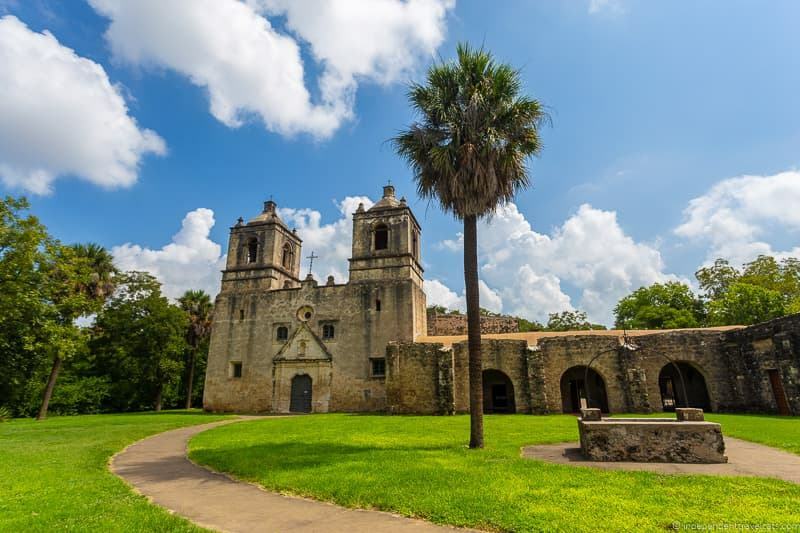 When visiting the San Antonio Missions National Park, you’ll want to plan in advance how you are going to get to the missions since they are outside of the downtown area. If you want to visit all 5 missions in San Antonio, you’ll need at least half a day so plan accordingly. If you only have time for two missions, we’d recommend The Alamo and Mission San José. 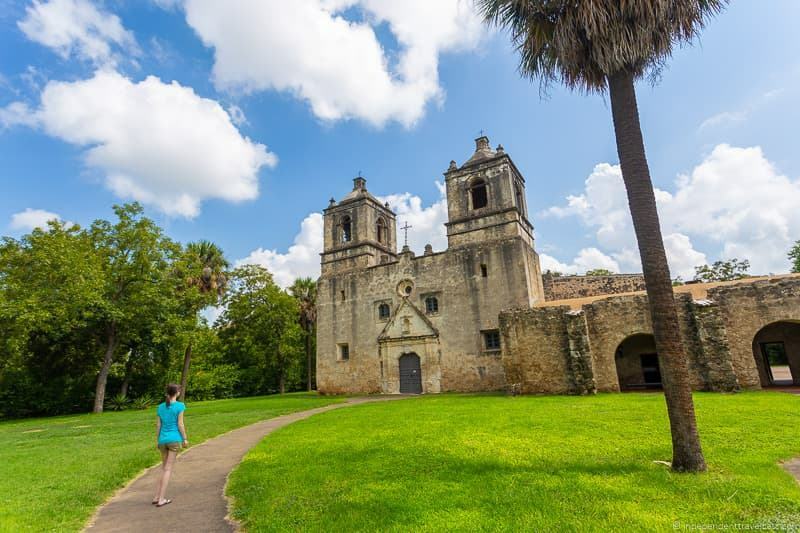 We recommend starting your visit of the San Antonio Missions National Historical Park at the park’s Visitor Center which is located at the Mission San José. 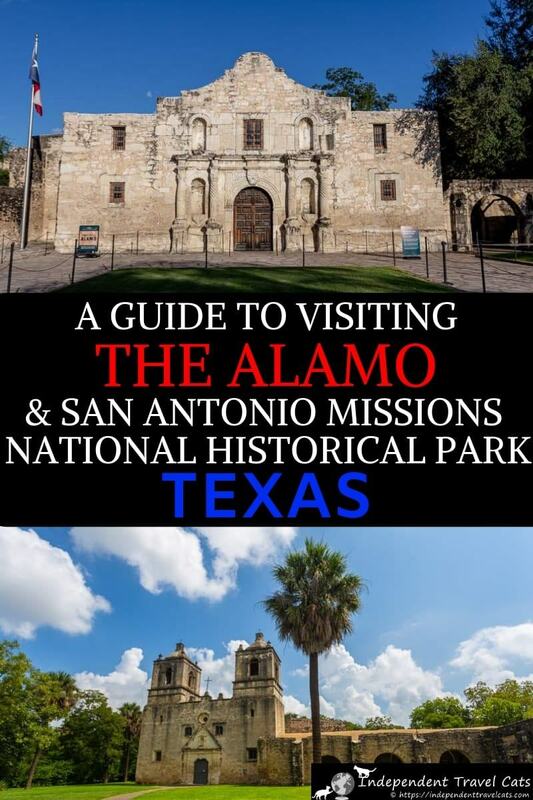 So that’s our guide to visiting The Alamo and San Antonio Missions National Historical Park! We hope this has helped you plan your trip to these attractions in San Antonio. Have you visited The Alamo in San Antonio or any of the other San Antonio missions? If so, tell us about it! As always, feel free to ask us any questions you may have about visiting The Alamo or planning a trip to San Antonio Texas. Very interesting to read the history that you’ve summarized here. Very interesting to read the history that you’ve summarized here. I’ve been to the Alamo as a child, but that was a long time ago. I would go see it again and appreciate it much more now than I did those many years ago. I think taking an evening tour is an excellent idea. It can be hot there during the day, and this is a great way to avoid the crowds and the heat of the day! I visited the Alamo in Texas many year ago as a teenager and did not really appreciate it very much then! But I am hoping to go back now as an adult later this year and will be using your guide. I really love the way you provides lots of history without being too overwhelming to make what may look like just an old building come to life and be meaningful. 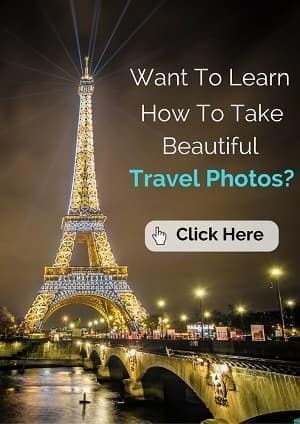 I am going to try to book one of the tours to get the most out of the visit as you recommend. I did not know about the other San Antonio missions so those are now on the list as well. Great job on this guide!